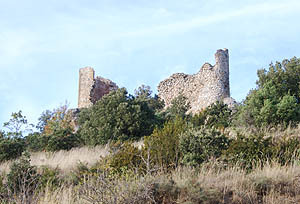 The Château Saint-Pierre de Fenouillet is a ruined castle in the village of Fenouillet, Pyrénées-Orientales, Languedoc-Roussillon It is also known as The Château de Fenouillet, or the Château Saint-Pierre. 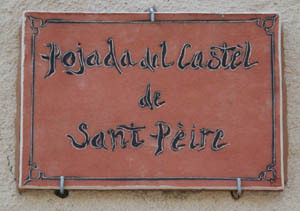 In Catalan it is the Castèl de Sant Pèire - Fenolhet, capitala de Fenolhedés (capital of the Fenouilles). 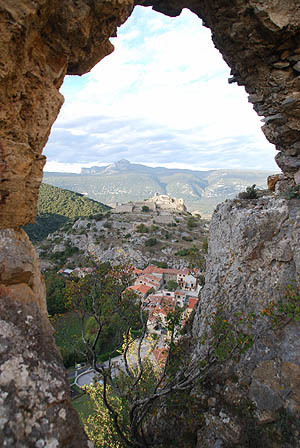 Nearby are two other castles Sabarda and Castel-Fizel, protecting access to the valley. 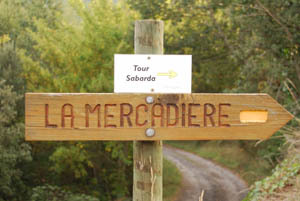 The Fenouillet Valley opens into a communication network of mountain routes, used since time immemorial, linking the eastern part of the Roussillon and Cerdanya with the upper valley of the Aude. 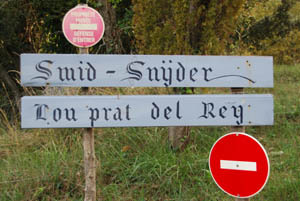 The site on which the castle is built is easily defended. 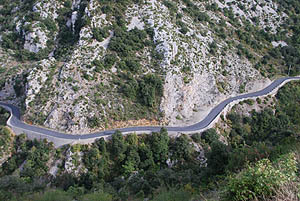 It stands on a huge spur facing the north, rising to 530 meters above sea level and bordered by two rivers. This position has prompted humans to settle there since the earliest times (proto-historic and ancient times). The modern village consists of a series of hamlets, as it has since the twelfth century . 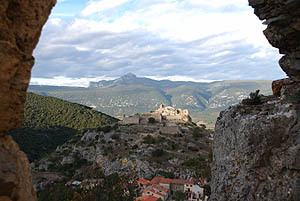 The Castle of St. Peter which dominates the landscape, is framed by two advanced fortresses, Castel Fizel to the north and Sabarda to the south . The first known mention of a territory named Fenouillides (Fenolheda) is in a text of 842 by which Charles, King of France gives a freehold to , more villages (cities rural ) in the Corbieres and Fenouilliet (pagus Fenulems) to one of his faithful followers, called Milo. The Fenouilledes, is sometimes referred to as pagus, sometimes as comitatus. Milo's successors, the counts of the Razès made their capital Rhaeda (modern Rennes-le-Château ). In 863-864 the County of the Razès came into the possession of the Counts of Carcassonne. 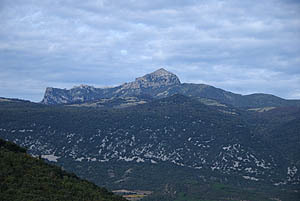 The Fenouilles (Fenolheda) passed in the late ninth century to the house of Cerdanya. 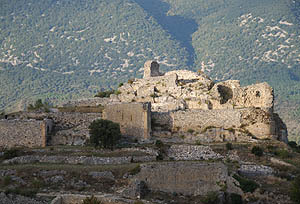 There are mentions at this time of a castle of Fenouillet and a court of the Fenouilledes. 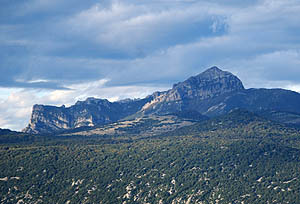 The vast domains of the counts of Cerdanya was subsequently divided between two branches of the family: the Count of Cerdanya and the Count of Besalù. The Fenouilledes becomes a viscounty within that territory of the Count of Besalù. There now appears a line of Viscounts of the Fenouilledes, administering a large territory and residing on the site. The viscounts significantly altered the appearance of the buildings on the headland. On the upper part a new residential complex was built. A keep and protective wall crowned the upper part of the site, surrounded by the village. In 1109 tensions arose between the families of Cerdanya and Barcelona. The Count of Besalù had bequeathed all his land to the Count of Barcelona. 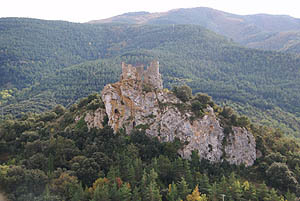 The Count of Cerdanya now claimed the lands of Fenouilledes and besieged the main strongholds of the viscounty. Guillaume Pierre, Viscount of Fenouillet, paid tribute for his castle. In a text of 1109 we find the first mention of the castle Sabarda (a watch tower to the south of Fenouillet). In 1111, a compromise was reached between the two houses the Count of Cerdanya and the Count of Barcelona, with the result that the Count of Barcelona recovered his legacy, the Fenouilledes. It is to him that Viscounts would now pay homage. In 1173, Arnaud, Viscount de Fenouillet, wrote his will. Presumably he thought that he would die childless, because he designated as his heir a nephew, Berenger of the Corbieres. This will was not enforced because of the birth of a posthumous daughter, Ava de Fenouillet. She later married Bertrand de Saissac, a nobleman from a powerful family based far to the north, at Saissac in the Black Mountains. Bernard now took the title of Viscount de Fenouillet. In the twelfth century, Bertrand de Saissac, Viscount de Fenouillet, was one of the major vassals of the Viscount of Carcassonne. Bernard is known for his Cathar beliefs, and his dislike of the Catholic Church. 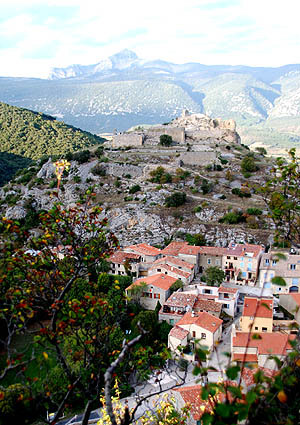 It is likely that the first Cathar preachers came to Fenouillet around this time. 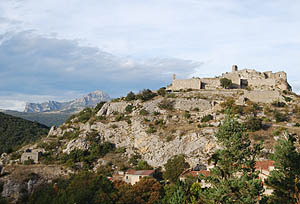 At the beginning of the thirteenth century Toulouse , Foix and Carcassonne, became targets of the crusade against the Cathars. Fenolheda was not the theatre of military operations, but it was enmeshed in irreversible political and territorial changes. Bertrand de Saissac, Viscount de Fenouillet, as a senior vassal of the Trencavels, Viscounts of Carcassonne, was directly involved in the fight against the Crusaders. At that time, the viscounts were probably at the height of their power. The defeat of the local nobility lead many disposed knights, called faydits in Occitan, to seek refuge in the Fenouilledes and Perapertusès . 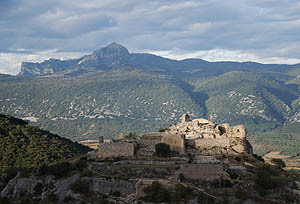 The castles of the local lords at Fenouillet, Montsegur, Puilaurens, Aguilar and Quéribus, become centres of resistance. It is in this context that Fenouillet assumed its present configuration. The active involvement of the Viscount and his vassals on the side of the local nobility entailed serious consequences. Pierre de Fenouillet, the son of Bernard and Ava, was deprived of his possessions in Narbonne in 1222. He continued to fight more fiercely fight, especially as the fortunes of war then turned to the advantage of the Occitan forces, who crushed the army of Amaury de Montfort, son of Simon de Montfort. In 1226, a new crusade swept the southern lands, led by Louis VIII, King of France. 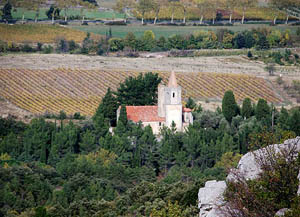 The Count of Roussillon, Nunyo Sancho, now reclaimed the Fenouilledes and Pérapertusès, with the approval of the French king. A violent war then broke out between the Viscount and Count of Roussillon. After the victory of the French crusaders, confirmed by the Treaty of Meaux in 1229, the Viscount abandoned the struggle. 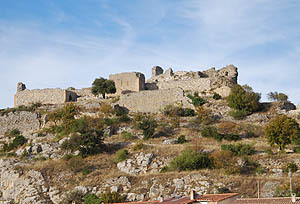 He sold his castle at Fenouillet and the Viscounty to Nunyo Sanche, Count of Roussillon, in recognition of the "extensive damage and harm" he and his men had committed in the Roussillon. This approach allowed Peter and his mother Ava to safeguard their rights and inheritances in Conflent, Cerdanya and Roussillon, allowing them to retire to safety. In 1236, Sancho Nunyo took part in the campaign in Valencia, in the army of the King of Aragon. Pierre de Fenouillet with his vassals and allies from the Pérapertuses took advantage of his absence to resume their military activities. The viscount, Pierre de Fenouillet, then took an active part in the last two major Occitan attempts to shake off their subjugation to the French: the campaign in 1240 by Raymond Trencavel of Carcassonne, to reclaim his inheritance (Carcassonne, Beziers, Albi, and the Razes); and then the general insurrection of 1242. The failure of both attempts was the end of Pierre de Fenouillet's hopes to regain his property. Peter definitively abandoned the Fenouilledes. He confirmed allegiance to Aimery, Viscount of Narbonne, and withdrew to his possessions Roussillon. He died in 1243 in the Templar Commandery at Mas Deu (east of the town of Trouillas in the Pyrénées Orientales) leaving a son, Hugh de Saissac. 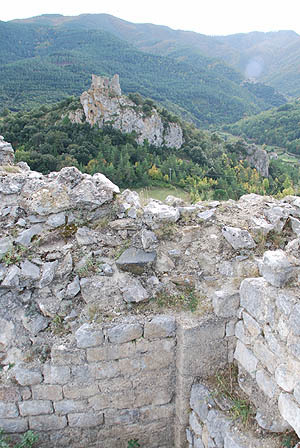 Cathars continued to live here. 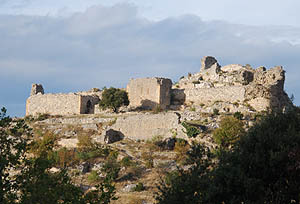 Inquisitorial registers record several witnesses identifying heretical groups in Fenouilledes and the castrum at Fenouillet, but not before the year 1240. 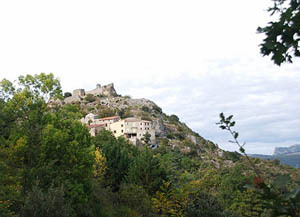 Interrogations are then directed by the inquisitor Ferrer of Perpignan (residing sometimes in Limoux and sometimes at the Abbey of Lagrasse). Imbert de Salles, one of the survivors of Montsegur said "I saw at Fenouillet, in the house of Bernard du Vivier, the 'parfaites' Marquèse et Prima. There was Caranac, a leather worker whose other name I do not know. Peter a textile worker, Peter de Vìlleraze, Bernard du Vivier and his mother, whose name a do not know, and Raymond Marti de Fenouillet"
Resistance to the French invaders continued in the Fenouilledes. under the famous faydit Chabert de Barbaira, which continued until 1255 when Quéribus was lost. In 1257 he relinquished the Fenouilledes to the King of Aragon. The following year, the treaty of Corbeil finally brought the Viscounty into the Capetian domain. 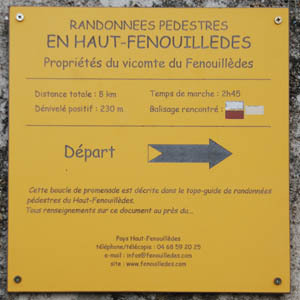 Fenouillet and the Fenouilledes were now French possessions. With the treaty of Corbeil, the Fenouilledes becomes a border area under the authority of the Viguiers of the Kings of France. 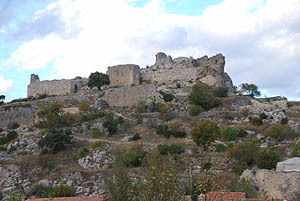 Castel Fizel was mentioned in 1260, and it seems that the castle there was enfiefed by the King of France to vassals in 1262. 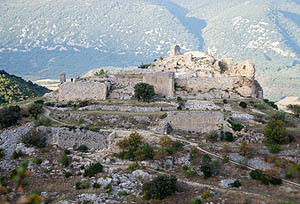 Fenouillet is mentioned as a royal fortress in 1272, but it was not until 1290 that we find Sabarda as a royal fortress. 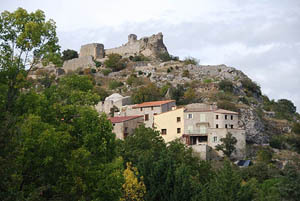 From the first half of the fourteenth century the community at Fenouillet seems to have been confused with the Caudiès which became the new centre of local power. Only the castle Sabarda continued to be documented. The Royal take-over of the Castle at Fenouillet did not apparently lead to any radical changes. 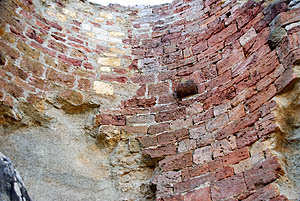 Archaeological discoveries in and around the keep suggest a gradual mutation. There are some typical elements of the thirteenth century. French royal coins have been found here. 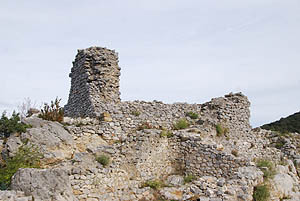 A semi-circular tower whose base can be seen on the ridge north of the castle has stones characteristic of the royal architecture. 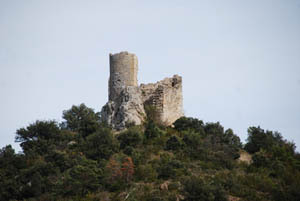 After the destruction of the fortress vicomtale this tower could have provided a visual link between the castle, Sabarda and Castel-Fizel . 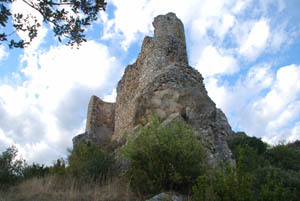 During the XIII and XIV centuries the castle was completely dismantled. 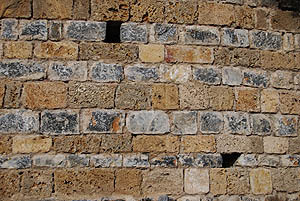 A ramp, probably intended to facilitate the work of demolition, was built against the door of the keep. This abandonment of the main site and the transfer of military defence to the small nearby castle of Sabarda can be explained by the fact that the broad promontory on which the castle of Fenouillet is built, could only be defended with the assistance of the people of Castrum. Given the small size of the royal garrisons assigned to monitor the border, it was more reasonable to modernised and strengthen a castle of a more manageable size. 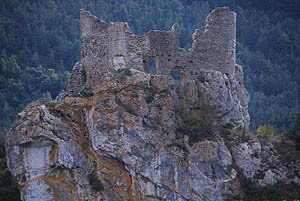 The castle is protected on its eastern and western sides by high cliffs. Beyond the buildings, the relief extends into a long ridge, down to a second line of defence forming a north and difficult access space of about 2.5 to 3 hectares. The fortress of the coast defended by a powerful household in the rock pit . On its southern side , the least remnants of walls and habitats thrive in an arc to the first houses of the present hamlet. 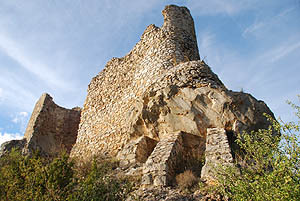 The ruins cover about 10,000 m2 of which nearly 1500 m2 are occupied by the castrum. Although badly damaged, the site displays all the characteristics of a local castrum, in which villager houses, fortification and an aristocratic residence are closely intertwined. The first wall is backs onto the houses the current village. 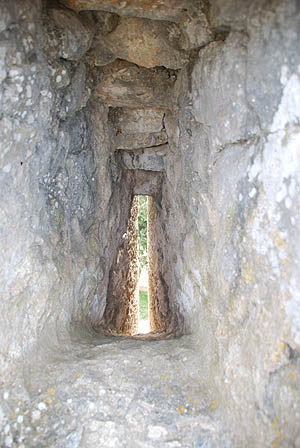 The main door of the castrum , lay to the East. The second wall lays in the middle of the slope. Its central part, the best preserved, has a relatively complex arrangement. It consists of several elements built at different times. 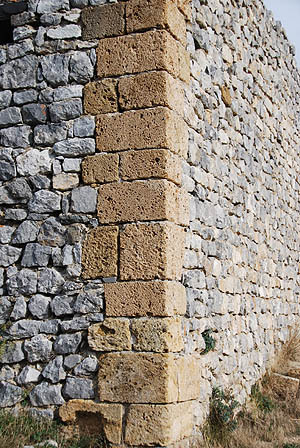 The oldest part is the base of a building has an elevation significantly higher, consisting of large blocks roughly squared, and noticeable different from other ramparts. 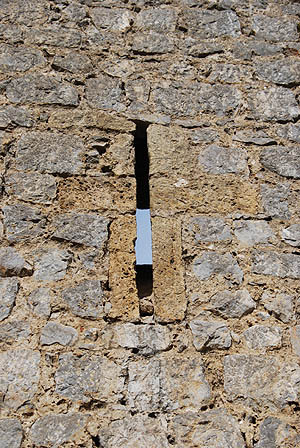 This second line of defence opened access to the castle by a gate of which the base remains. Beyond the second wall, the medieval remains are buried under two long terraces. 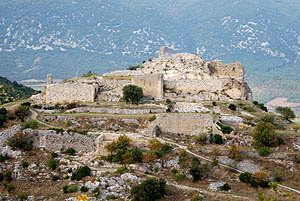 This space is dominated by the castle which occupies the summit of the promontory. 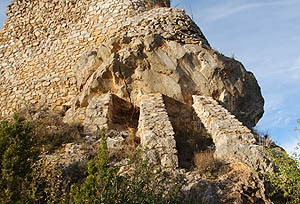 The castle ruins are part of a triangle. The southern side is bounded by a wall which stood in the centre, by a barbican. This is a beautiful solid rectangular building. The quoins are of yellow-ocher limestone, perfectly cut. The tower is defended by three arrow loops covering the path leading to the entrance gate, located on the west side, a typical device in the region, where most of the castle entrance-porches are arranged frontally. 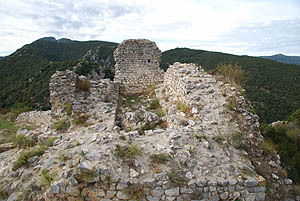 The central area of the castle is occupied by a large flat terrace of nearly 150 M2 dominated the north by the rectangular tower remains, with very thick walls. 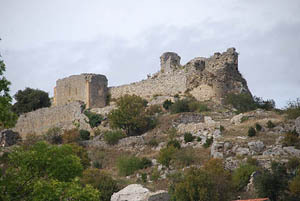 It extends to the east up to the ruins of the castle church. It features a typical nave with two bays opening onto a semi-circular apse. Elevations have disappeared and only the base of north wall remains. 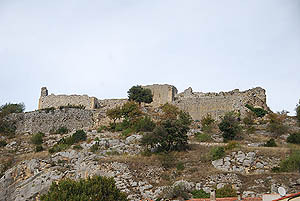 Projecting from the southern wall, Southwest of the castle, are the remains of a rectangular building. To the north are the remains of a quadrangular building, almost completely buried . It shows the trace of a postern opening on one of the few crossing points between the castle and the long ridge that develops beyond. 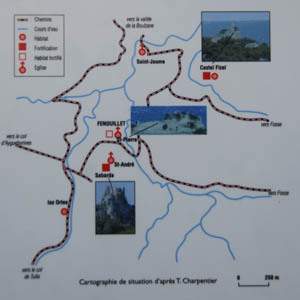 The Municipality of Fenouillet (70 inhabitants) , decided in 1994, to launch a study of the Castle of St. Peter. Stratigraphic surveys revealed rich archaeological potential. 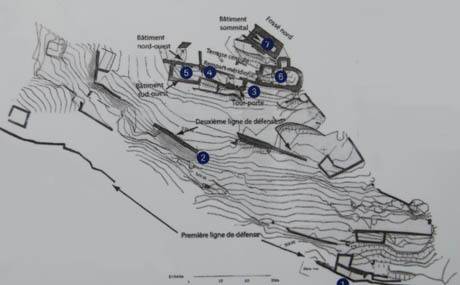 The Ava association Fenouillet , annually hosts a supervised by a professional archaeological team, reinforced by scientific collaborators. Ceramics, coins, bronze and iron objects, food, coal, seeds, are carefully studied to reconstruct the everyday and the surroundings of Château Saint Pierre in the Middle Ages. Studies of charcoal found in the levels of the first half of the XIII century shows a change in vegetation indicating increased population pressure on the environment. From an architectural point of view, the residential areas were extended at this time. The defensive side of the fortress was developed: the barbican was built on the site of the original gate. Lines of walled terracing were developed to form a chicane. The keep is large, with thick walls. Excavations carried out in this building have, among others, revealed for the first half of the thirteenth century, traces of intense aristocratic and military occupation related to levels of soil and embankments particularly rich. A large amount of iron items, mostly crossbow, was found associated with a unique set of elements in gilded bronze decorations of clothing or furniture, sometimes hit a heraldic symbol , including weapons family FENOUILLET (chequered gold and blue ) . Many méreaux were discovered, also with heraldic representations. The remains of meals , mainly animal bones and fish bones, are also characteristic of a noble table, in particular, the presence of remnants of bear paws, probably corresponding to seigneurial dues . Actes du Colloque du Centre d'Études Cathares Carcassonne, 4, 5 et 6 octobre 2002. Editions du Centre d'Études Cathares, Carcassonne, 2004. Bayrou L, Entre Languedoc et Roussillon, 1258-1659. Fortifier une frontière ? Les Amies du Vieux Canet, 2004, 447 p.
Sagnes, J, (dir) Le Pays Catalan, SNERD, Pau, 1985, t 2.